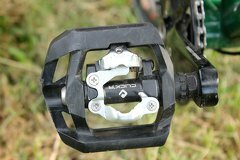 For my touring bike I got Shimano's PD420 Click'R pedals, which are dual pedals which have flat platform for walking shoes on one side, and allow you to clip in with cycling shoes on the other side. They are the successor of the PD400. They are the new model for 2014 and have wider platform, which should be a more comfortable, and and are quite a bit lighter. 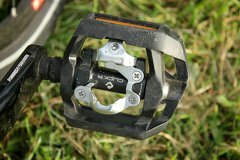 Like most clipless MTB and touring pedals they use the SPD-system, developed by Shimano for mountain bikes it also works great for touring. 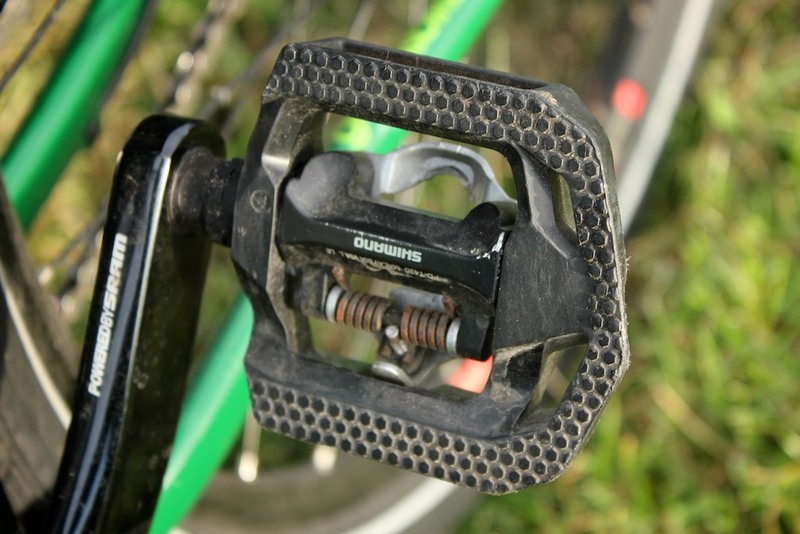 The difference between other systems for racing bikes is that the cleat is slightly recessed on the shoe so that it can also be used for walking. 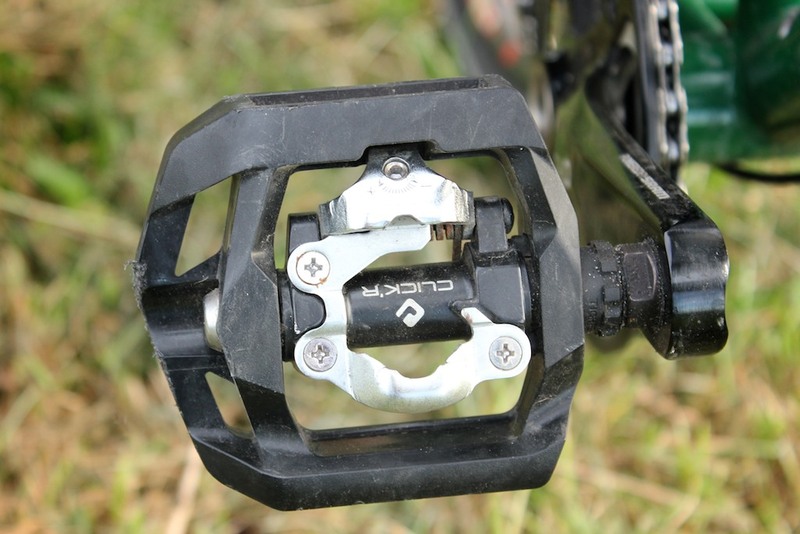 The pedals are different from regular SPD in that they use the "Click'R" system, meaning that the springs in the pedals are weaker, making it easier to clip in and out. 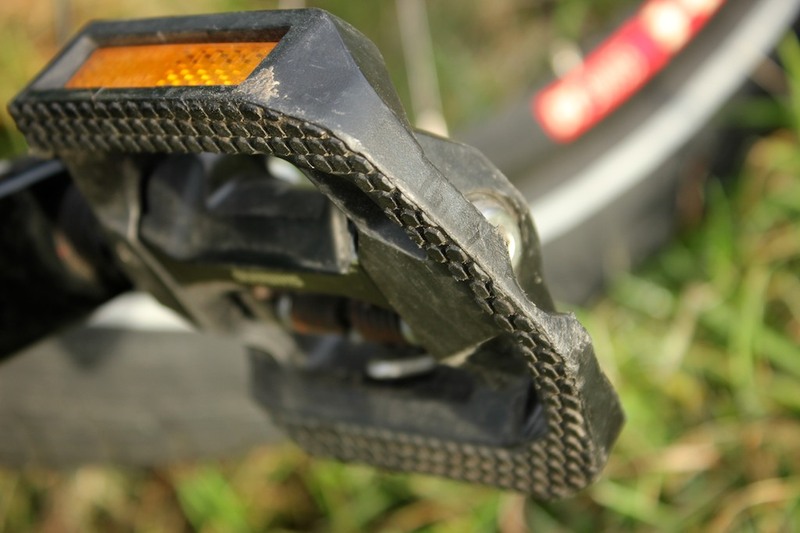 Since many SPD-pedals are meant for mountain bikes they nearly always lack these reflectors, this is a pleasant exception. Reflectors on pedals are required in some countries (including the Netherlands, Germany, Denmark, Great Britain, and many more) to ride at night. 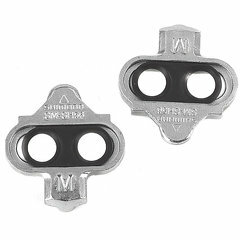 Like most SPD pedals it comes with a set of cleats that you have to install on your cycling shoes. These pedals come with the SH-56 multi-directional release cleats. You can recognize these cleats by their silver color. With these it is even easier to release your feet from the pedals as you can just pull them off in more directions. I did not (yet) install the silver cleats as I still had some black ones on my shoes. With the black cleats you can only release your feet by twisting your ankle outward. Feet can be released in multiple directions. Installing the pedals is super easy. They are marked with an L and R to indicate what side they go on. Each pedal has a slot for a hex key in the bottom of the axle so a pedal wrench is not even needed. 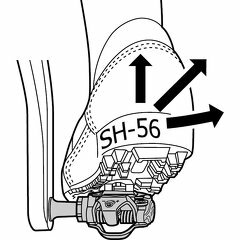 As is normal with bicycle pedals you need to turn left to tighten the left pedal, and right to tighten the right pedal. The springs in SPD-pedals are adjustable. Whenever I used them I always had them on the weakest setting, which worked OK for me. 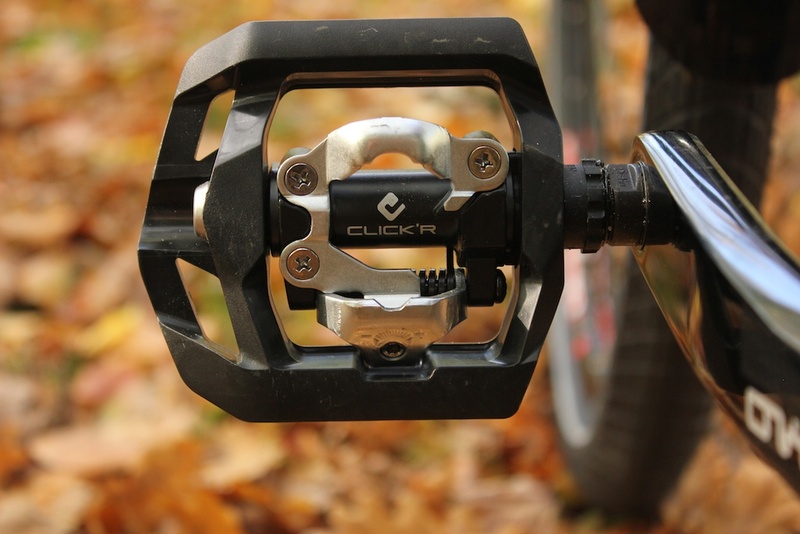 The Click'R pedals that go even lower (but not as high) which is perfect for me. I started off with the springs in the lowest setting. Clipping in is so smooth that you sometimes not even feel or hear the click. On some of the first rides this almost made me fall over when coming to a stop because I did not realize I was clipped in. After having some issues with my knee I started using my cycling shoes more. It helps me keep my legs in the correct position and prevents pain in the knee joint. Please note that when a cleat is not properly positioned on a cycling shoe this can worsen, or even cause knee problems. According to the specifications there is about 3 degrees of play, meaning you can move your foot around a little bit without clipping out. This is pretty much standard for SPD-pedals, and is fine for me. Although it is easier to clip out, I never accidentally clipped out from the PD-T420's. But then again, I don't ride much on rough terrain. 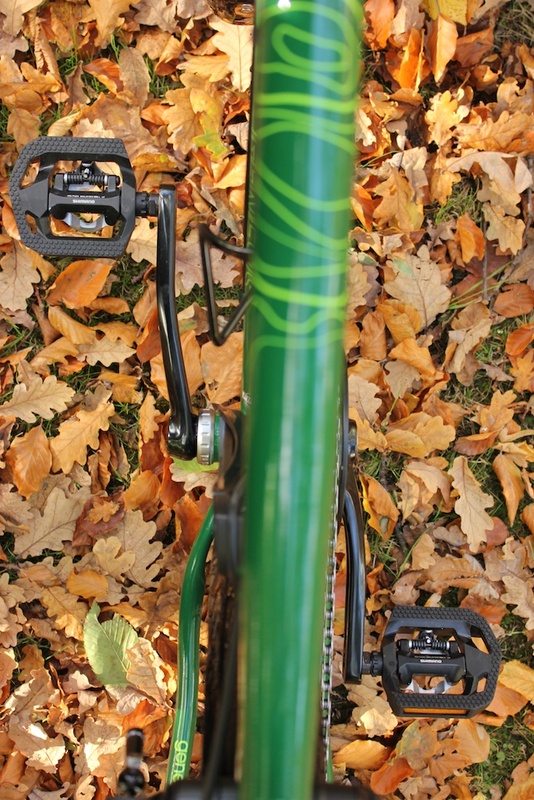 The platforms are made out of some kind of plastic material, there is no noticeable flex in it while cycling. I really don't like pedals with metal pins for grip, as they do far more damage when they hit your shins. The wide platform provides enough surface area to get a good grip with walking shoes, and is more comfortable when wearing shoes with thinner and softer soles. I find that using dual pedals like this is not the best of both worlds as it might appear, it is very much a compromise. When riding in the city where you have to stop for traffic lights you will spend some time fumbling around turning the pedal with the right side up. Of course you an still pedal with your feet on the wrong side, but with walking shoes you can feel it through the sole, and don't have as much grip. After a several long rides I did get better at flipping the pedal with my feet. I am now able to feel the position, and flip the pedal with my feet without having to look down. It's not a big problem, but is something to keep in mind. On longer rides it is less of an issue. 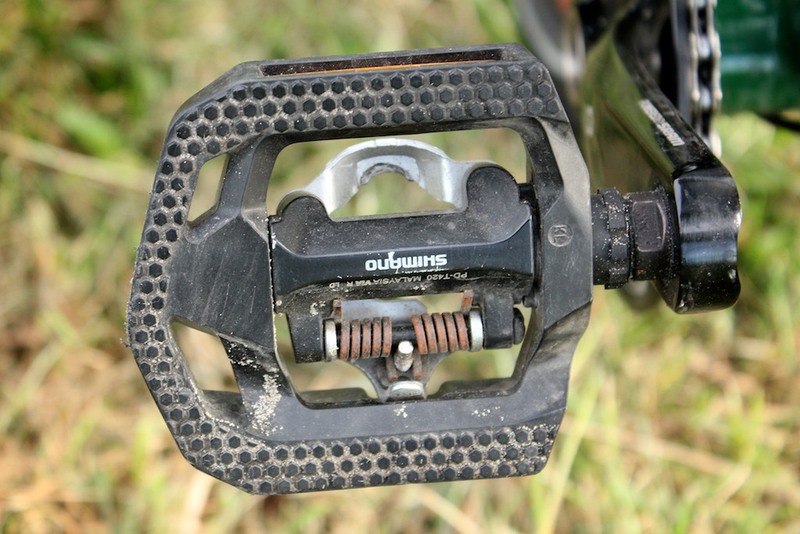 The big platforms make these pedals very comfortable to use with any kind of walking shoe. 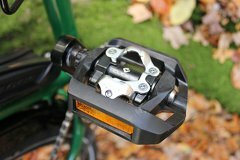 After using the pedals for almost a 1000 kilometers the left pedal developed a click, which I could both feel and hear once every rotation. The problem would somteimes dissapear for a while and then come back again later in the day. I ordered Shimano's special pedal tool (TL-PD40) and intended to clean out the bearings. However, before I got a chance to do that the problem went away by itself. After about 150 kilometers and the pedals are spinning smoothly and quietly again. 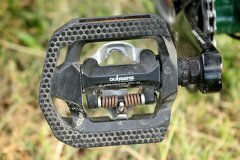 I have used the pedals on a 3.5 day trip through the Belgian Ardennes on some rough paths, with my walking shoes and never had a problem with slipping off the pedals. 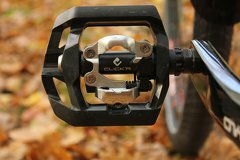 After a 2 week trip to Sweden the pedals do show some wear from scraping against rocky surfaces, but are still fully functional. In the summer I took the bicycle out to the beach several times, and left it there for a few hours each time. Soon after the tension spring started to rust a bit. On the right side of the page you can see pictures of the pedals after using them about one year. Although they have some scratches I have not noticed any negative impact in their performance. One of my worries was the the plastic platform would slowly wear away form scraping against walls and such, but so far there has not been any significant wear. The platform side is nice and big. SPD side with adjustment screw on the bottom. Built in retroreflectors make these pedals street legal at night. 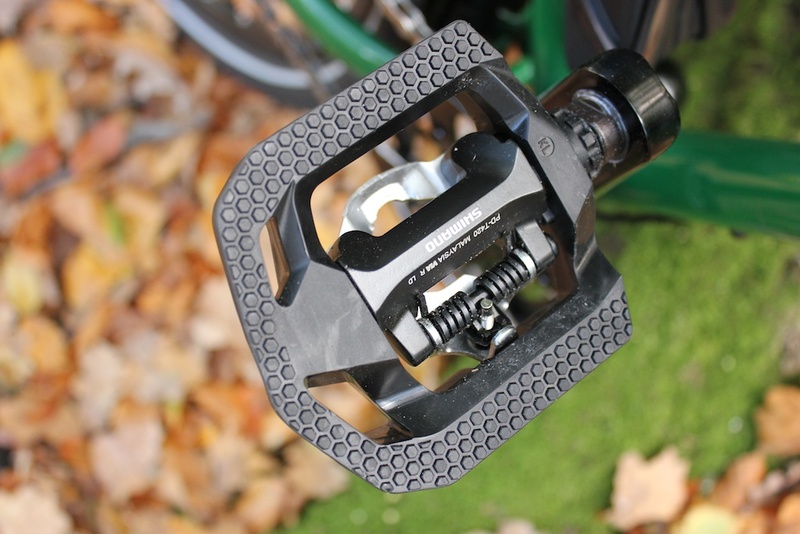 Because the SPD side is heavier the pedals tend to end up with the platform side up. The platform side of the left pedal has some damage on the aluminum center. The tension spring has started to rust. 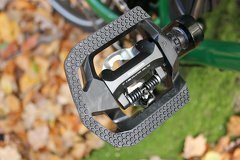 The SPD side of the left pedal is still in good condition. The pedal has some scrapes on the side form leaning against concrete, but the amount of wear is minimal. The spring on the right pedal has an equal amount of rust. On the right SPD side there is some corrosion.